A great new starting point for the Man of Steel is here in SUPERMAN VOL. 1: SON OF SUPERMAN, part of the most critically acclaimed, best-selling, all-new line of volume one graphic novels, DC Universe Rebirth! When the Man of Steel died defending his adopted home, it seemed that the spirit of truth and justice he represented was extinguished forever. But watching from the sidelines was another Superman - older, wiser, more experienced - with his wife, Lois Lane, and their son, Jonathan Kent. Now this refugee from a vanished universe is stepping out of the shadows, ready to assume the mantle of his fallen counterpart and take to the skies once more as Earth's greatest hero. The machine mind known as the Eradicator is on the trail of the House of El, and its hardwired directive to protect the Kryptonian genome permits no consideration for any other forms of life - not even those that share Kal-El's blood. 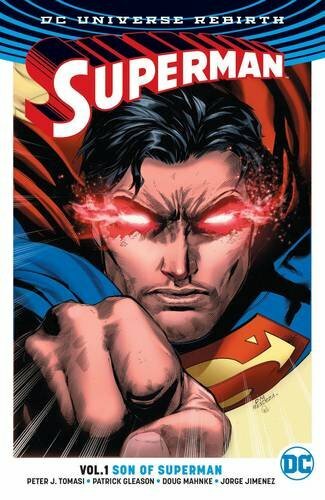 Can the son of Superman harness his newly emerging powers in time to resist the annihilation of his humanity? Or will he be reborn into a new Krypton forged from the ashes of his mother's world? Exploding out of DC's blockbuster Rebirth event, SUPERMAN VOL. 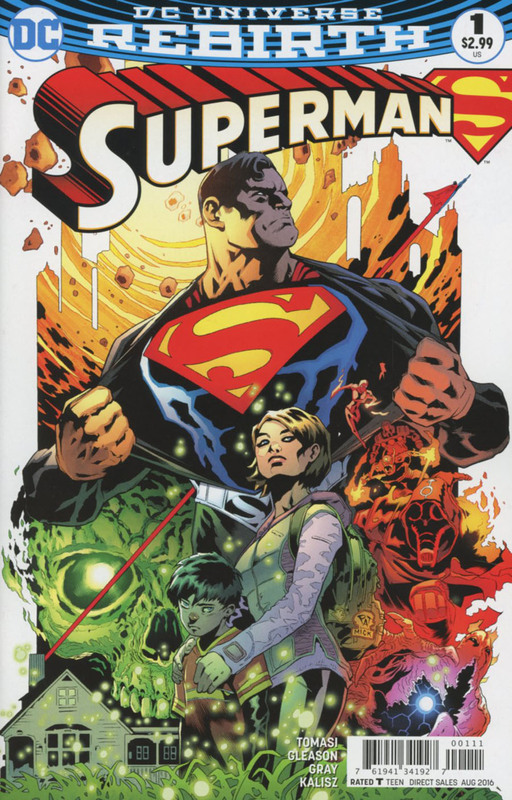 1: SON OF SUPERMAN marks the beginning of a new era for the Man of Tomorrow and a great jumping-on point for new fans - brought to you by acclaimed storytellers Peter J. Tomasi, Patrick Gleason, Doug Mahnke, Jorge Jimenez, Mick Gray, Jaime Mendoza, John Kalisz, Will Quintana and Alejandro Sanchez! Collects issues #1-6 and the SUPERMAN: REBIRTH one-shot. Story - 5: Now this is a Superman I can get behind! For the past couple of years, I have been unhappy with the state of the Superman comic books. DC had tried taking the character down a path that Superman should never go down. The New 52 left a bitter taste in my mouth, particularly with the Truth storyline. The only reason I kept buying was out of dedication to the character and hope that things would get better. The Rebirth initiative was well worth the wait. This collection picks up right after the events of The Final Days of Superman with the Pre-Flashpoint Superman taking the place of the New 52 Superman. Along with him are his Lois Lane and their ten year old son Jon. Tomasi and company create a wonderful flowing narrative that keeps the reader interested and eager to read the next chapter. Character moments are balanced well with action set pieces. Moments between Clark and Jon are genuine and heart-warming. Whether you're a newcomer or a returner to the world of Superman, this first volume is sure to entertain and delight. Art - 4: I cannot give Patrick Gleason enough praise for his artwork. Action scenes are large and bombastic, gentle moments are given room to breathe, and splash pages are captivating. For those uninitiated with Gleason's work, it will take at least an issue to fully adapt to his borderline cartoonish style. Cover Art - 3: The ingredients are there but I'm not sure what they were going for with this blandly colored cover? The illustration itself is great, but it feels and falls flat as a cover because it feels a little half hearted, like there was a deadline and there wasn't time before press. Here is a little test - after reading the story flip back and look at it, does it suit the story? Variant Cover Art - 5: It's a little hard to rate the cover of a collected edition as most of the time, an individual issue's cover is recycled. Here, we see the artwork from the Superman: Rebirth one-shot. The drawing is well-done, but the heat vision eyes just don't do it for me. It gives the impression that the contents of the book will feature an edgy or angry Superman which is certainly not the case. If I were to choose an image to replace the cover, it'd be the cover to Superman (vol. 4) #1. It's much more fitting.